3G Routers – Will It Accelerate Fixed Broadband Replacement? I have been commenting quite regularly in this blog about how mobile broadband (based on USB dongles and modems) is increasingly being used by mobile-only operators (those without fixed assets) to accelerate the replacement of fixed broadband, primarily in Europe. The spectacular growth in mobile broadband subscriptions is being driven by aggressive pricing from mobile operators, along with free laptop bundling offers – built-in 3G support for laptops and netbooks isn’t hurting either. One missing element in this puzzle has been a way for multiple members in a household or a small office/home office to share a mobile broadband connection in a simple plug-and-play fashion. Enter the consumer-friendly WiFi-over-3G Router! 3 UK is rolling out the nifty Huawei D100 router – insert your dongle into the router and share your mobile broadband with WiFi-enabled devices such as PC, Mac or a laptop. The 3 store claim “There’s no need for a landline, because the Wireless Router does all the work” is a clear indication that they are going after fixed broadband. If most people are already making voice calls on their mobile phone, it is a small step for the consumer to wonder if he needs the landline at all! It remains to be seen how many consumers will be happy with a monthly usage plan under 15GB especially with the increased usage in online video. Surprisingly, the mobile broadband plan for the router does not include the 15GB monthly allowance plan (which is an option for the laptop plan) – for some strange reason, only the 5GB allowance is available. One would expect that people who buy into this 3G Router in order to share their mobile broadband would sign up for a plan with a higher monthly data allowance. Clearly, 3 is also looking for this product to create stickiness – 3’s compatibility statement indicates that the router has firmware to ensure that a modem from any other carrier does not work properly. I am a little surprised that 3 UK is not offering a bundled voice + mobile broadband offering. Both (3) Sweden and (3) Austria have been selling Huawei’s 3WLAN Router E960/E970 for a while now – in addition to 4 Ethernet interfaces and WLAN support, this 3G Router also has a RJ11 interface, ideal for connecting the black phones. It is not clear if voice is transported as VoIP over 3G in this case. Several operators including Vodafone Egypt and Optus (Australia) are offering this product in their mobile broadband portfolio as well. T-Mobile in UK announced a similar product called “Mobile Broadband Share Dock” earlier in the month, but unfortunately, it is still not available for purchase (unlike 3 UK). 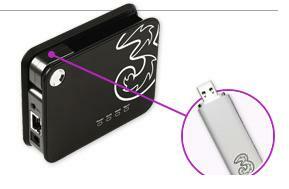 The concept is similar – plug in your old T-Mobile USB modem or a new one into the dock and share the mobile broadband amongst as many as three people (3 UK claims their product can support 4 end users). I am betting Vodafone and the other operators in UK will follow suit if this concept catches on.